Let mediAvatar Blu-ray Creator lead you to high definition journey on HDTV. Create Blu-ray movie discs from HD camcorder videos (MTS, M2TS, TS), iPhone 4 videos (MOV), and almost all other high-definition and standard-definition video files [AVI, MP4, MKV, DV, MPEG, QuickTime Video (MOV, QT), Real Video (RM, RMVB), DivX, H.264/AVC, XviD, WMV, ASF, DAT, FLV, VOB, 3GP, etc.]. No blu-ray discs (BD-R, BD-RE, BD-25, BD-50) right at hand? Well, convert these videos to AVCHD DVDs (DVD-5, DVD-9, DVD-R, DVD+R, DVD-RW, DVD+RW, DVD+R DL, DVD-R DL) in Full HD 1080p, and also BDMV ISO & AVCHD ISO image files. 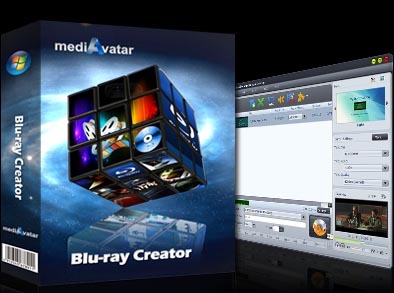 mediAvatar Blu-ray Creator takes you to luxurious HD enjoyment on any Blu-ray players or Sony Playstantion® 3 game console right now. No matter movies (MTS, M2TS, TS) shot by your Sony, Panasonic, Canon, Hitachi or JVC AVCHD camcorders or DVs, or MOV videos taken by your iPhone 4, or high-definition and standard-definition videos (AVI, MP4, MKV, DV, MPEG, MOV, QT, RM, RMVB, WMV, DivX, H.264/AVC, XviD, ASF, DAT, FLV, VOB, 3GP, etc. ), this blu ray creator can burn these videos to blu-ray discs, AVCHD DVDs or ISOs. It has never been easier to convert and burn HD camcorder videos, iPhone 4 MOV videos as well as common videos to blu-ray discs (BD-R, BD-RE, BD-25, BD-50) and AVCHD DVDs (DVD-5 & DVD-9) by using this Blu-ray disc creator. Not just burn blu-ray discs or AVCHD DVDs, you also have the options to create BDMV & AVCHD ISO image files from M2TS, MTS, TS, AVI, MP4, MKV, DV, MPEG, MOV, QT, RM, RMVB, WMV, DivX, H.264/AVC, XviD, ASF, DAT, FLV, VOB, 3GP and many other video formats. Create blu-ray movie menu or AVCHD DVD menu easily by choosing a menu template. Menu title, movie title, movie duration, background picture can be edited freely. There may be some unwanted clips in your movies, this blu-ray burner helps you clip your movies to just burn the parts you want to blu-ray movies. Got subtitle and audio files for your blu-ray movies? Load them to your blu-ray movies or AVCHD DVDs to create multilingual movies, or replace original subtitles/soundtracks with new ones. Crop movie frame size freely to remove the unwanted borders from your movies. Only burn the highlights to blu-ray discs! Apply artistic image effects (black and white, negative, old film, and more) to change your blu-ray movie style completely. It would be better to insert watermarks (image & text) to your blu-ray movies so as to stop your movies from piracy or illegal usage. Convert videos to high-definition BDMV and AVCHD in various resolutions: 1280x720p, 1440x1080p, 1440x1080i, 1920x1080i, and 1920x1080p. Set the writing speed, zoom mode, and number of copies before burning videos to blu ray movies. Converts and burns videos to blu-ray discs at high speed, and furtherly introduces NVIDIA CUDA accelerating and multi-core CPU processing technologies to promote the burning performance while creating blu-ray discs on PCs with CUDA-enabled GPU and multiple cores. Allows you to preview the movies when clipping, adjusting effect, adding subtitles/watermarks/soundtracks easily, and take a snapshot before burning. Multiple languages are available to choose from: English, German, French, Italian and Spanish. Rip and convert blu ray movies to MKV, AVI, MP4 and other popular video format files. DVD creator, convert and burn videos to DVD movie, DVD folder or ISO files. Rip and convert blu ray movies to iPad H.264 HD movies, or H.264, MPEG-4, MOV videos.